If you have important data that you need to have easy access to at all times, carrying it around on a USB flash drive makes sense. Unfortunately, these tiny storage devices are easily lost, and software encryption methods may not be 100 percent reliable. If you want to guarantee that your personal data doesn’t fall into the wrong hands in the event of the loss -- or theft -- of your drive, the best solution is a hardware encrypted memory stick like the new USB 3.1 Aegis Secure Key 3z from Apricorn. This is a thumbdrive with a built in alphanumeric keypad. In order to use it, you just need to wake up the drive by pressing the unlock button. Enter either an Admin or User PIN, and then press the unlock button again. Provided the PIN has been recognized, the green LED will flash for the next 30 seconds, giving you time to connect the drive to a USB port. Once plugged in, it will function like any other USB drive. 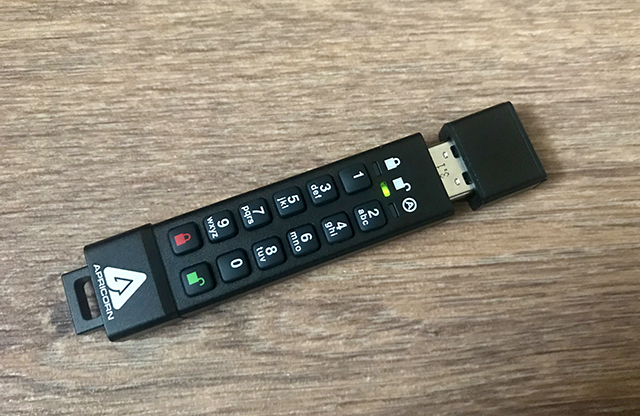 The Aegis Secure Key 3z is FIPS-140 Level 3 certified for security (it uses 256-bit AES XTS encryption) and unlike alternative drives, it doesn’t come with a default PIN, so the first thing you’ll need to do is set one up. To create an Admin PIN, press the unlock key, and the green and blue LEDs should glow, indicating no PIN exists. Press the unlock key and the number 9 key, and when the green LED begins blinking, enter your choice of PIN, press unlock, and then enter it a second time and press unlock once more. Admin PINs need to be between 7 and 16 digits in length, and can’t contain all consecutive numbers (so no 1234567) or be all the same numbers (no 1111111). Assuming the PIN is accepted, you can press the lock button, or just wait for the drive to enter sleep mode. Once you have an Admin PIN you can add one or more user PINs and optionally create one-time recovery PINs for users. As I mentioned previously, unlocking the 3z is just a matter of typing in a PIN, pressing unlock, and then connecting the drive. A warning in the documentation explains that you shouldn’t press any buttons when the drive is connected, as doing so could damage the drive and the port as a result of the downward pressure. There are a number of other features which provide additional security -- you can set the drive to automatically lock after 5, 10, or 20 minutes of inactivity, and also create a self destructing PIN that will wipe the drive when entered. In order to stop anyone attempting to guess a PIN, the drive comes with brute force protection. After three unsuccessful attempts, the drive will add delays to subsequent guesses, and after ten wrong attempts, the drive will lock. You can get another ten attempts by pressing a key combo and entering a special code. Failure to enter the correct PIN after the next ten goes however, will result in all of the data on the drive being wiped. You can, at any time, perform a complete reset on the 3z -- handy if you forget your PIN and want to start over. The drive, which is IP-57 certified water and dust resistant, is powered by an internal battery and charges whenever connected to a USB port. If the battery dies between uses, you can power it up in a USB port, and then unlock it. Wear resistant rubberized buttons means that your PIN digits won’t be revealed after years of constant use. On test, we found the Aegis Secure Key 3z worked exactly as expected. Brute forcing the drive eventually wiped it, and while it’s not the fastest drive on the market, it should be speedy enough for most people’s needs. One thing worth mentioning though, is unlike standard thumbdrives, the 3z does get quite hot pretty quickly. It won’t burn your hands, damage your USB port, or anything silly like that, but it will surprise you the first time you go to unplug it. The Aegis Secure Key 3z is available in a choice of capacities from 8GB up to 128GB, and priced from $79. You can buy it direct from Apricorn.